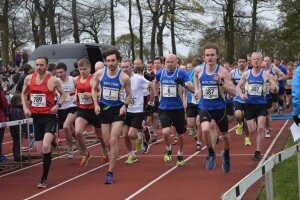 The Bolton 10K’s 702 field saw Bolton United Harriers host another slick event with racing drama unfold in both the men’s and women’s race. Cool but dry conditions at “daft o’clock” were greeted by the team setting up the 2-lap course within Leverhulme Park. Sunrise brought more club helpers and Registration opened up at 8am-ish! As the One Mile Fun Runners dashed off, the marshal briefing got underway without the need for Fortress Bolton (the club gazebo! ), though cover would soon be preferable as light showers moistened the participants almost as soon as the starter’s gun was fired. Bolton’s Tony Valentine was in a strong silver position before a slip at the base of Spooky Hill put paid to his momentum; instead of mounting a battle with Horwich’s Michael Cayton, who won for the second successive week, it allowed Lancaster & Morecambe’s David Brown to pass in the final 500m for silver. 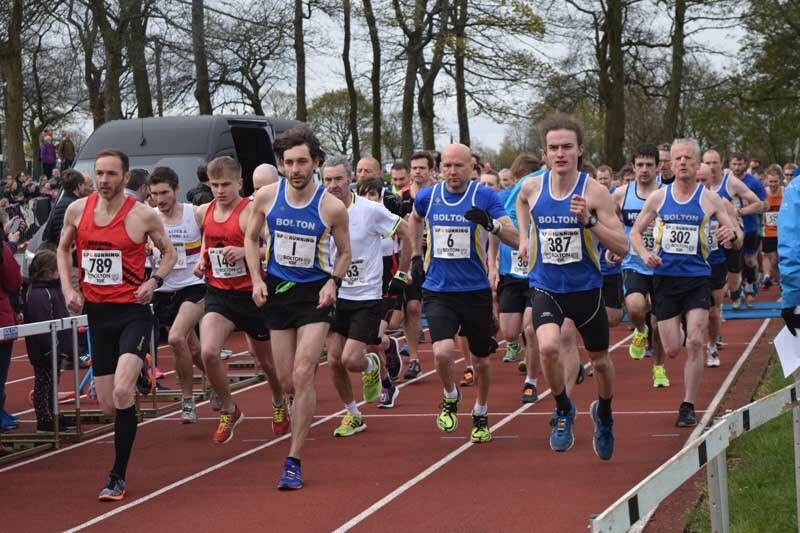 Shay Walker was able to return to competition for the first time in nearly a year, superbly keeping ahead of fellow M45 Simon Dally, whilst junior Declan Toomey edged into the Top 10 to give Bolton the team victory over Horwich. Completing the sub-40 set were U20 Danny Shaw and the improving Chris Topping. 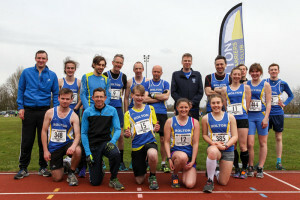 In the women’s race, Bury AC’s junior star Sophie Whittaker edged Bolton’s leading light Nicola Cartridge for a second successive year, but this time the metal up for grabs was gold. With 70m to claw back at the halfway stage, Cartridge’s quicker second lap almost pulled it off; the gap was whittled down to 5 seconds, but track literally ran out. Cartridge spearheaded the race team alongside Rachel Bailey and F50 Lesley Heyes which collected bronze behind Bury and Burnden RR. Bailey, for her part, led the promising junior trio that included of Mercedes Mercer and Olivia Kearney, as positions switched again from last week’s Radcliffe 10K emphasising the optimism for the coming months and years. For Bolton, that 31 runners completed was incredible given the commitment to put on the race – over 40 otherwise regular runners assisted. Some achieved PBs whilst others beat their own course records. Notable mentions go to Cecilia Woods as first F55+, whilst 15-year-olds Joe Gande and Scott Hood joined George Shepherd in making their open debuts at the 10K distance. University of Bolton SSIC students raised over £100 for Cancer Research UK, as some of the racing lecturers got firsthand experience of their students’ progress following their own 10K jogs – Lorcan Cronin earlier than most after finishing fourth! They weren’t the only ones – many runners enjoyed (if that is the right term?!) a post-race sports massage. Local residents were appreciative too, as they watched the spectacle and even donated some refreshments to a couple of lucky marshals. Full results and links are available via the Bolton 10K website at www.bolton10k.org. The One Mile Fun Run held at 9am before the 10K saw 98 entrants range in age from 3 years old to 60 years young! 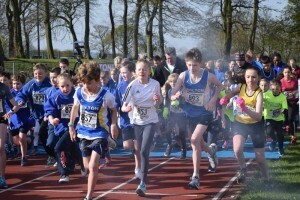 Junior Blue Vests formed over a quarter of the field, with some great performances to match the attendance. 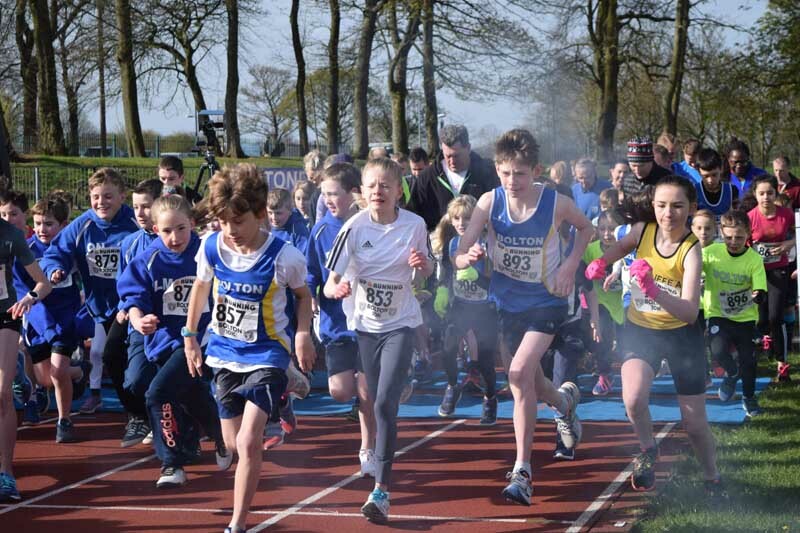 In the open under-15s, Ben Pickford (aged 12) claimed silver with 5:58 behind Bolton Tri’s Leon Callaghan, whilst Isabella Merritt (aged 10) was again fourth overall and second girl (6:12) around the one lap course. The kitbag mementos and medals were well received, though the Haribo sweets appear to have won the day!